Texas A&M University students living on-campus can receive mail via their University Apartments provided mailbox or rent a Post Office Box. Mail is not delivered to individual on-campus residents rooms or apartments. Residence hall and Corps residents may rent mailboxes from Student Mail Services or the U.S. Post Office. Apartment’s residents have centralized mailboxes available at no additional cost. Mail service at the Commons and Hullabaloo Hall is Under New Management! Check the Corps of Cadets and Residence Halls toggle below for more specific information. Mailboxes are provided at the University Apartments as part of your housing charges. Each apartment is assigned one mailbox for the residents to share and each student resident is issued a mailbox combination upon moving into an apartment. The apartment community also has several package mailboxes. If you receive a key in your mailbox, this indicates you have received a large package and must pick it up in the large mailboxes. Mail delivery is handled by the U.S. Post Office for Gardens Apartments and by Texas A&M University Mail Services for White Creek Apartments. Mailboxes for the Gardens Apartments Building F thru L are located on the outside of the laundry building. Mailboxes for Gardens Apartments M thru Q are located on the outside of the activity building. The pick-up location for Gardens residents for signature required mail and all USPS packages that do not fit in the parcel boxes is the College Station U.S. Post Office located at 2130 Harvey Mitchell Pkwy South. Pick-up hours at this location are from 9:00am – 5:00pm, Monday – Friday and 9:00am – 12:00pm, Saturday. Any parcels that are not delivered due to size and/or require a signature must be picked up at the College Station Post Office. Any undeliverable mail (i.e., no building #, no suite #, no resident listing) will either be immediately returned to sender or will be recycled in the case of junk mail. Any mail that is delivered to your box but is not your mail can be brought to the Gardens Apartments Office for redirection or be placed in the outgoing mail slot for USPS to re-deliver or return. Mailboxes for White Creek Apartments are located on the outside of Building A. The pick-up location for White Creek residents for signature required mail and all USPS packages that do not fit in the 36 parcel boxes is the Mail Services building located at 330 Agronomy Road. This pick-up location is open to students from 8:30am to 12:00pm and 1:00 pm – 4:30pm, Monday – Friday. Any parcels that are not delivered due to size and/or require a signature will be held for a period of 7 days beginning with date listed on the delivery notice and will be returned to sender at the end of that 7 day period if not claimed. Any undeliverable mail (i.e., no building #, no suite #, no resident listing) once Mail Services exhausts their lookup resources will either be immediately returned to sender or will be recycled in the case of junk mail. Any mail that is delivered to your box but is not your mail should be placed in outgoing mail slot and Mail Services will redeliver or forward/return through USPS. Mailboxes are not provided for residence hall or Corps of Cadet residents, however students may rent mailboxes, buy postage, ship packages, and more on campus at the Northgate U.S. Post Office located at the corner of University Drive and Houston Street or through Student Mail Services facilities located on northside in Hullabaloo Hall, Room 136 and in the Southside Commons, Room 126. Box sizes, rental rates, services, and hours of operation vary. Contact the Post Office or Student Mail Services via the contact information below. 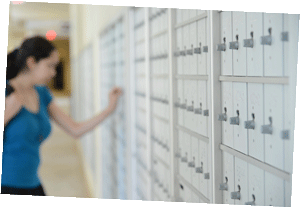 Upon renting your mailbox from Northgate U.S. Post Office or Student Mail Services, you will be provided with a mailing address. All residents need to be sure to file a change of address or forwarding address form with the U.S. Post Office. This can be done at any U.S. Post Office or online at USPS.com. Residents are also encouraged to update their address on their Texas A&M University student record before they move or change residences so mail delivery will not be interrupted. FedEx and UPS are allowed to make deliveries to student rooms and apartments. We suggest that residents are in their room or apartment at the time of delivery. FedEx and UPS are not allowed to leave packages for residents at the residence hall or apartment office or the area offices. Area offices will not accept packages for residents.